The concept of SEO is evolving with each passing day. With new Google updates paving the path, many SEO practices have also come in the limelight. In this case, the website owners too will have to make various strategies in order to enable their website stand among the top searches. For this, one should be aware of the latest Google updates and the SEO trends. Apart from the traditional organic ranking, in order to gain an audience on a website, SERP features too are becoming the choice of the website marketers. Some of the SERP features are local packs, featured snippets, knowledge panels etc. Now the question is how can you accomplish this? Well, with the help of software, one can easily find out the ranking of their website in accordance with the SERP features. Moreover, one can also supervise and find out those SERP features which boost your website’s keywords and that which also direct the targeted audience. It is a well-known fact that the area of search results is getting wider in terms of diversity. Under such scenario, one cannot ignore the chance to make full use of this fact. Structured data helps search engines to understand content using specific vocabulary, it also specifies the fact that how a content should be presented on SERPs. So, they definitely enhance your SEO ranking, and so you should try to incorporate structured data as soon as possible. Speed plays a vital role. It not only serves as a parameter that decides the ranking of your website but also serves as a major UX factor. The question arises what is termed as the “fastest”? Google specifies the page that loads in 3 seconds. To begin with, examine the Google’s page speed. Launch the website auditor and build a project. After this, switch to the content analysis and enumerate the page on which the test needs to be carried upon. Google employs a number of ways to check the quality of content. One way out of them is to check if a piece of content is comprehensive or not. So, try to compress your content too. For this, you can use tools like Website Auditor or TF-IDF tools. These tools, search the best pages which can give you top ranking on search engines. Still not sure about carrying the search via voice? Let us tell you that as per Google census about 50% of the people carry voice search and this percentile is growing at a very fast pace. The most lucid feature about the voice search process is that one can use very common and normal sentences for the same. 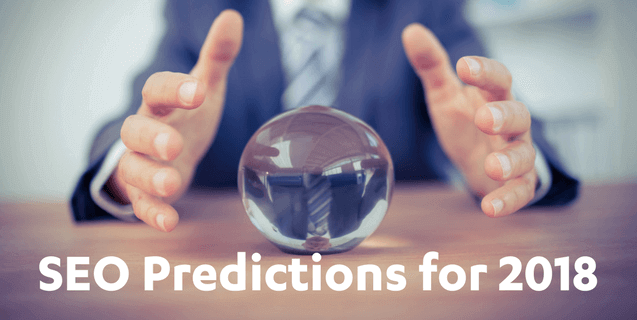 These are some of the SEO predictions and trends that are expected to rule in 2018. What are your views on this? Do share with us in the comments.